469 pages | 64 B/W Illus. The edible food packaging industry has experienced remarkable growth in recent years and will continue to impact the food market for quite some time going into the future. 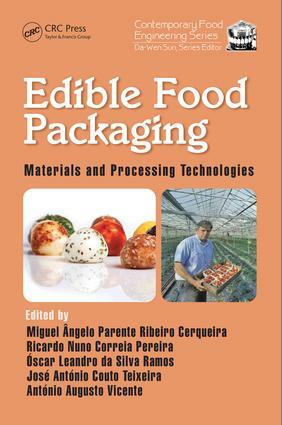 Edible Food Packaging: Materials and Processing Technologies provides a broad and comprehensive review on recent aspects related to edible packaging, from processing to potential applications, and covering the use of nanotechnology in edible packaging. The book’s 14 chapters promote a comprehensive review on such subjects as materials used, their structure-function relationship, and new processing technologies for application and production of edible coatings and films. Specific topics include edible film and packaging using gum polysaccharides, protein-based films and coatings, and edible coatings and films from lipids, waxes, and resins. The book also reviews stability and application concerns, mass transfer measurement and modeling for designing protective edible films, and edible packaging as a vehicle for functional compounds. The authors explore antimicrobial edible packaging, nanotechnology in edible packaging, and nanostructured multilayers for food packaging by electrohydrodynamic processing. Additionally, they show how to evaluate the needs for edible packaging of respiring products and provide an overview of edible packaging for fruits, vegetables, and dairy products. Lastly, they examine edible coatings and films for meat, poultry, and fish. Miguel Ângelo Parente Ribeiro Cerqueira graduated in chemical and biological engineering at the University of Minho (UM) where he received two scholar merit awards (2002 and 2003) and a scholarship merit award (2005) during graduation. He earned his PhD in December 2010, and he received an award for the best PhD thesis in 2011 from the School of Engineering of UM. Since April 2011, he is a postdoctoral researcher at UM. He was selected as one of the winners of the Young Scientist Award at the 17th IUFoST World Congress of Food Science and Technology, 2014 (Canada). Ricardo Nuno Correia Pereira graduated in 2003 in food engineering from the Portuguese Catholic University in Porto, Portugal, and earned his PhD in chemical and biological engineering in 2011 at the University of Minho in Braga, Portugal. During his early career, he participated in several research projects, both nationally and internationally, in the food industry. He has worked as a consultant for a number of private and public sector clients (professional and educational) related to food technology. Before earning his PhD, he also obtained an MSc in biotechnology–bioprocess engineering in 2007 from the University of Minho in Braga, Portugal. Óscar Leandro da Silva Ramos earned a BSc in microbiology (4-year program) from the Portuguese Catholic University, Porto, Portugal, and a PhD in technological and engineering sciences with a specialization in biochemical engineering from the New University of Lisbon, Lisboa, Portugal. He is now a postdoctoral researcher at the Centre for Biological Engineering (CEB) of Minho University, Braga, Portugal, and at the Department of Chemical Engineering, University of Porto, Portugal. He has authored or coauthored more than 20 papers in peer-reviewed journals in the field of food science and technology, plus six chapters in edited books. José António Couto Teixeira is a full professor and currently the head of the Centre for Biological Engineering (CEB) of Minho University. He is responsible for scientific research and advanced formation in the areas of biological and chemical engineering and carries out research in industrial and food biotechnology and bioengineering. His research activities have been focused on two main topics: fermentation technology (multiphase bioreactors, in particular) and food technology. He also is interested in food nanotechnology as well as in the production of bioactive compounds for food and medical applications. António Augusto Vicente graduated in food engineering in 1994 from the Portuguese Catholic University in Porto, Portugal, and earned his PhD in chemical and biological engineering in 1998 at the University of Minho. He has received his habilitation in chemical and biological engineering from the University of Minho in 2010. From an early stage of his career, he has kept close contact with the food industry and is involved in several research projects, both nationally and internationally, together with industrial partners either as a participant or as a project leader.